This dry erase notebook never runs out of pages. Sketch, draw, and list your ideas—the hypergloss film and pen limit smudging and encourage many, many drafts. It looks like your classic vegan leather journal from the outside, but inside it's an eco-friendly and mistake-friendly solution. Dimensions: Original: 8.5" x 11" x 0.25"; Mini: 5.8" x 8.25" x 0.25"; Pocket: 3" x 6" x 0.5"
Weight: Original: 0.5 lb. ; Mini: 0.5 lb. ; Pocket: 0.18 lb. I have the small pocket size and use it to keep lists. My paper notes were always getting lost. This solves that problem and is much more efficient and handy. If you want to color code you can get the same Staedtler correctable pens in a set of black, blue, red, and green. What happens when you cross a dry erase board with a notebook? 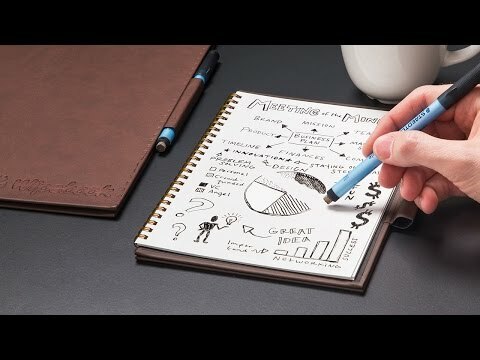 You get an endlessly reusable notebook—one you can fill over and over with sketches, diagrams, notes, lists, or your day’s to-do’s. The forgiving, hypergloss film pages encourage unlimited drafts, but limit smudging. Each Wipebook comes with a smudge-proof pen so your thoughts and projects stay intact—until you decide to re-use a page. The engineers behind this Grommet are Toby Maurice and Frank Bouchard—they wanted to jot down and showcase ideas without the waste. So they created something you can use over and over again. 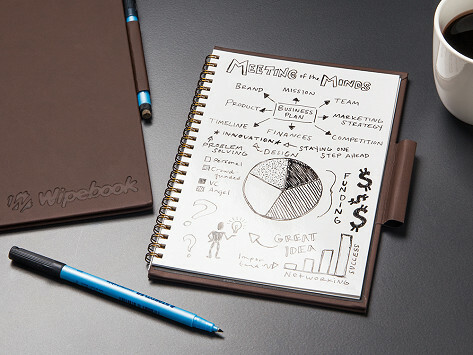 We really liked that, at first glance, Wipebook looks like your classic vegan leather bound journal, but inside it’s an innovative, environmentally friendly way to take notes, doodle and more.